“Just arrived in South Africa, Chalmers’ most advanced radio receiver is Sweden’s main contribution to the record-breaking telescope SKA (Square Kilometre Array). The advanced prototype, now being tested in the Karoo Desert, is not only shiny and new. It’s also an important step towards a radio telescope that will challenge our ideas of time and space. Onsala Space Observatory at Chalmers University of Technology, Sweden, has delivered its largest technology contribution to the SKA (Square Kilometre Array) project. A metre (3 ft) across, the 180 kg (400 lb) instrument is the first in place of over a hundred to be mounted on dish antennas in the Karoo Desert, today home to the 64-dish-strong new MeerKAT telescope. The Band 1 receiver, as it is called, allows the dish to measure radio waves with a frequency between 0.35 and 1.05 Gigahertz. 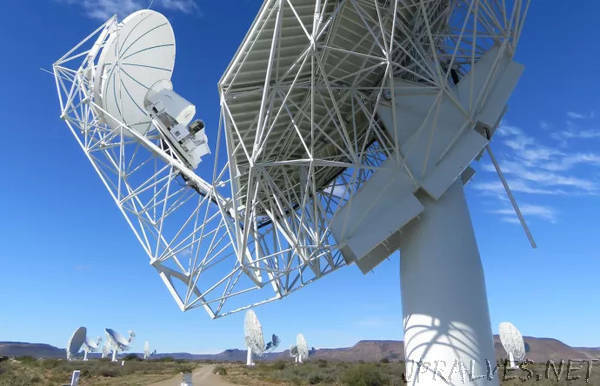 The receiver is being tested on one of the 64 antennas in MeerKAT, one of today’s largest radio telescopes and is in the same location in the Karoo desert where the SKA’s antennas will be located. The instrument is a prototype manufactured in Sweden by Chalmers University of Technology in collaboration with Swedish industry, and it is designed to be mass-produced. Sweden is one of 11 countries in the international SKA project, which will build the world’s largest radio telescope at radio-quiet sites in Africa and Australia. The project is approaching the end of its design phase and construction is expected to start in the early 2020s. As part of the SKA, Swedish receivers will participate in measurements of radio waves from many different sources in space. Scientists expect to make most sensitive radio measurements ever. They plan to test Einstein’s theories to their limits and to explore the history of the universe by measuring millions of galaxies at distances of millions of light years. “This is a proud moment for us, getting a first glimpse of what the world’s biggest radio telescope will be like. We work with developing the world’s best receiver technology and hope that our contribution to the telescope will make it possible for humanity to see things we have never seen before”, says Miroslav Pantaleev, project manager for SKA at Onsala Space Observatory. The receiver’s journey to Africa has been preceded by intensive collaboration between researchers and engineers at Onsala Space Observatory together with industrial partners, to ensure both performance and resilience. Before its trip, the instrument underwent tough environmental tests in Sweden, both in Onsala and at Saab Bofors Test Centre in Karlskoga. John Conway, professor of observational radio astronomy at Chalmers and director of Onsala Space Observatory, looks forward beyond MeerKAT to the future dish array, SKA-mid.